Set of 4 ceramic hybrid double sealed, radial, deep groove ball bearings. 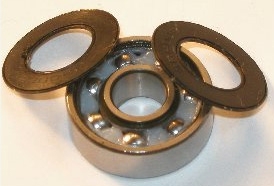 These bearings are made of chrome steel with ceramic balls and a steel cage, are closed with double rubber seals to protect the bearing from dust or any possible contamination, and are pre-lubricated with grease. 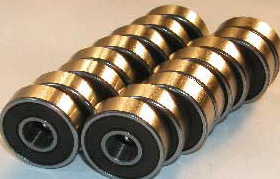 The bearings are of electric motor quality rated for speeds of up to 38000 revolutions per minute. NOTE: These make a great addition to any mount but are intended to be installed during a HyperTuneTM or mount cleaning and relubricating procedure Because installation of new worm gear ball bearings requires nearly complete disassembly of the mount it is highly recommended that they be installed in conjunction with a HyperTuneTM of the mount.. While they can be installed without doing a HyperTuneTM , it is not recommended. Because of the complexity of disassembling the mount, separate instructions are not provided for the installation of the ceramic hybrid worm gear ball bearings.